The Snæfellsnes (Icelandic pronunciation: [ˈstn̥aːivɛtl̥sˌnɛːs]) is a peninsula situated to the west of Borgarfjörður, in western of Iceland. It has been named Iceland in Miniature, as many national sights can be found in the area, including the Snæfellsjökull volcano, regarded as one of the symbols of Iceland. With its height of 1446 m, it is the highest mountain on the peninsula and has a glacier at its peak. "jökull" means "glacier" in the Icelandic language. The volcano can be seen on clear days from Reykjavík, a distance of about 120 km away. The mountain is also known as the setting of the novel Journey to the Center of the Earth by the French author Jules Verne. It is one of the main settings in the Laxdœla saga, and was according to this saga the birthplace of the first West Norse member of the Varangian Guard, Bolli Bollasson. Other historical people who lived in the area according to the saga include Guðrún Ósvífursdóttir, Bolli Þorleiksson and Snorri the Goði. The area surrounding Snæfellsjökull has been designated one of the four National Parks by the government of Iceland. Local fishing villages and small towns on the northern shore of Snæfellsnes include Rif, Ólafsvík, Grundarfjörður, Stykkishólmur and Búðardalur. Near Hellissandur is the tallest structure in Western Europe, the Longwave Radio Mast at Hellissandur. Snaefellsnes Community has recently become the first Green Globe Certified Community in Iceland and Europe, and only the 4th in the world. Snaefellsnes Community has been committed to the Green Globe Programme since 2003 and have successfully Benchmarked for the past 5 consecutive years. 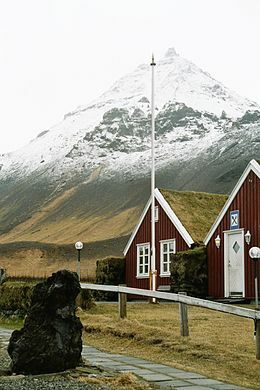 In June 2008, the Snaefellsnes Community reached certification status as a Green Globe Community.